Tegan and Sara have been making music for rather long time. The Canadian duo first started off mainly playing guitars, but as things have progressed they’ve become a full fledged pop entity and we love it. Their latest album, Love You To Death, was their second proper pop album and it is brilliant. Complete with dark songs about heartbreak, love, and sisterhood, the record, which is the band’s eighth, is delightful. Along with the album, the two sisters, Sara and Tegan Quin, have decided to release a music video for each track. So far, they’ve had clips that involve dogs(! ), paid homage to queer artists, and one that dealt with anxiety. Now the pair have released their latest video for “Stop Desire” and it’s rather sexually suggestive and we can’t stop laughing. The Wes Anderson inspired clip was directed by Allister Ann and sees the band dressed up on some seriously #throwback outfits. "We wanted to marry the high-energy and colorful vibe of Stop Desire’s production with the longing sexual undertones of the song’s lyrics for this video," Tegan and Sara wrote on Facebook talking about the video. "Director Allister Ann created a colorful world for us where we go throughout our day straight-faced while encountering characters finding sensuality in every day things." 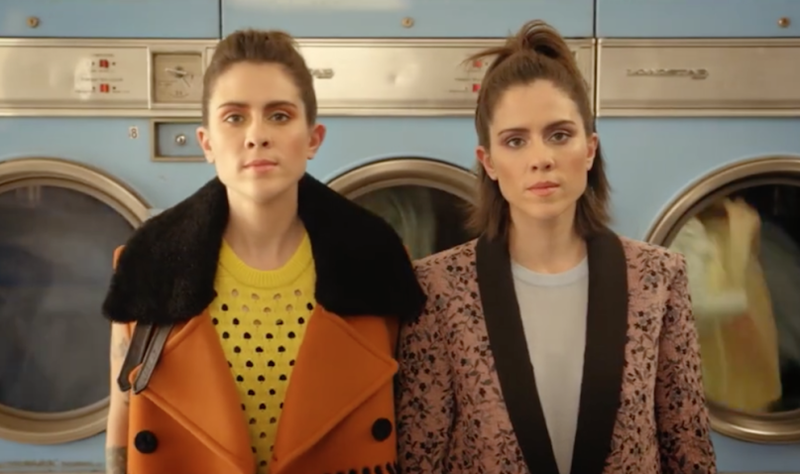 The clip sees Tegan and Sara, among other people, doing a bunch of normal everyday things like visiting the post office and laundromat all juxtaposed with suggestive images. Isn’t it brilliant and kinda hilarious? "The idea of having Sara and me live out a day in this strange and colorful world — where we remain straight-faced while encountering highly suggestive characters doing everyday things — really made us laugh,” the band said. Talking about the song on their website, Tegan said that while writing “Stop Desire” she wanted capture the difference between desire and love. "Can we truly love someone and still desire them?" she postured. "And why so often do we want (desire) someone else, when we have (love) someone already? "Esther Perel has a book called Mating In Captivity that I read recently. I read it years after I wrote Stop Desire, but she beautifully outlines this exact concept. I loved the idea that the video for Stop Desire would entertain on a very basic level, just like the song itself. And then if people are interested in digging to explore the deeper levels of desire and love, this video also encapsulates the complex daily temptations of our existence." Currently, the band are on a massive U.S. headline tour. For dates and ticket information visit their website.